Almost 400,000 Wranglers are affected. Automakers haven't had a good time with airbags recently. The Takata scandal has affected more than 34 million cars and even the multi-million dollar LaFerrari has had airbag issues. Now, 392,464 Jeep Wranglers from 2007-2010 are being recalled for airbag-related issues. 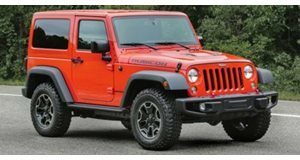 FCA is also recalling 7,435 additional Wranglers from 2011-2016 that are equipped with right-hand drive for special duty use. The recall will replace a clock spring in the steering wheel that may fail to deploy if it has been exposed to dust and dirt. An investigation by FCA determined that the clock spring may fail if it is exposed to dirt "consistent with extensive off-road driving or driving with a vehicle's top and/or doors removed." Good thing no one actually takes their Wrangler off-roading. If this condition is present, the airbag warning light will illuminate. Anyone who thinks their car is part of this recall should call FCA US Customer Care Center at 1-800-853-1403.